You’ll have read in our ALE magazines about our coach tours visiting rural pubs. We leave Cambridge at 11 and return at around 7. It’s a bit of a mystery tour for most as only the organiser and driver knows the route beforehand. We can visit up to ten pubs having a half or two in each. We run a raffle to contribute towards costs and obviously we pay for our food, beer & ciders. Our next tour takes place on Saturday 21 April. If you’d like to join us please e-mail Helge who is co-ordinating numbers for this trip. If you come on the trip we would like you to score the beers you have. It’s easy to do via WhatPub either from your phone while you are in the pub or from home afterwards. 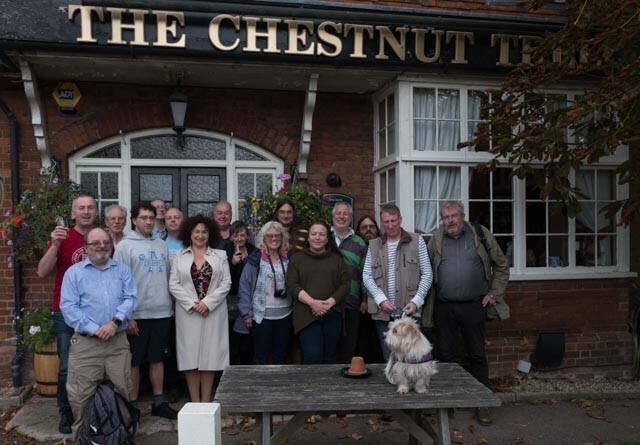 If you are very lucky Gladys the dog might come along, like on our trip in October when we stopped for lunch at Chestnut Tree, West Wratting.